According to a recent study published in the medical journal Pediatrics, more than a thousand children die of gun violence each year, and thousands more are treated for gun-related injuries. In the wake of the Parkland school shooting and the upcoming March for Our Lives in Washington, D.C., the obvious question is being asked: How do we protect our children from gun violence? For most Americans, the answer is clear: gun reform. For the National Rifle Association, however, the answer is something called the Eddie Eagle Gunsafe Program, a curriculum launched in 1988 for kids from kindergarten to fourth grade and starring—you guessed it—cartoon eagle Eddie Eagle. Eddie is everywhere. In 2014, over 30 states received state-funded grants to be put toward Eddie Eagle materials. He’s a staple at NRA events like the Great American Outdoor Show and even local non-NRA events. The program has found particular success working with law enforcement agencies around the country. The NRA reported that in 2017, over 850 orders of Eagle Eddie materials went out to law enforcement agencies, as did 13 Eddie Eagle costumes. The costume is a $2,800 eagle suit, and there are a long list of stipulations for its usage, as detailed in a great 2016 Full Frontal with Samantha Bee segment. The most recent version of the program can be summed up by watching a roughly eight-minute video called, “Learn Gun Safety with Eddie Eagle and the Wing Team.” In the video, the titular bird and his carefully diverse group of avian friends stumble across a gun in a random backpack in their local park. When one friend thinks about touching it, Eddie heroically steps in, teaching the others to, as he sings, “Stop. Don’t Touch. Run Away. Tell a Grown Up,” in a very easy-to-learn (and admittedly catchy) jingle. Yet as wholesome and educational as this all seems, the dark cognitive dissonance of the whole exercise is always lurking in the corner. For instance, an adult in the video explicitly says, “It’s always the best choice to get away from a gun.” This is obviously good advice. It’s also wildly at odds with the NRA’s stated goal of making guns more accessible in general, an effort that includes suggesting parents store their firearms in children’s rooms, suing over legislation that raises the minimum purchasing age for firearms to 21, and pushing for more guns in schools. Eddie was essentially conceived as a Trojan Horse. While Eddie Eagle is the NRA’s attempt to create an apolitical, kid-friendly safety mascot like Smokey the Bear or Woodsy Owl, the risk guns pose are very different and far more fraught than forest fires and pollution. And while the NRA would love for everyone to believe that Eddie Eagle is both a successful and politically neutral program, evidence points to the contrary. To really understand the NRA’s agenda with Eddie Eagle, it’s important to go back to the beginning. Eddie was essentially conceived as a Trojan Horse. The character and program was developed in 1988 by Marion Hammer, the ultra-powerful Florida lobbyist behind a string of infamous gun laws, including the “Stand Your Ground” law. According to the Violence Policy Center—which released a report in 1997 describing Eddie Eagle as “Joe Camel with feathers”—Hammer created the program as a way to deter lawmakers from passing Child Access Prevention (CAP) Laws, which criminalize keeping firearms easily within reach of children. Hammer’s argument was that, instead of punishing adults for keeping a dangerous object around children, children could learn to simply not touch or use a gun that they might have access to—effectively shifting the responsibility of not getting shot by a gun an adult left lying around to kids. Nonetheless, the program was introduced into schools around the country and thanks to NRA lobbying, states like Florida, Alaska, Nevada, Georgia, Idaho, and others passed resolutions encouraging schools to adopt the Eddie Eagle program in their curriculum. The program is divided into three separate tracks: pre-K/kindergarten, first and second grade, and third and fourth grade. The materials include videos, interactive activities, coloring books, and workbooks with word puzzles, mazes, and writing prompts. There’s also an interactive website. In 2015, Eddie Eagle got a major makeover. The NRA released the eight-minute video seen at the beginning of this post, with CGI animation, new bird characters, slimmed-down wording (according to the NRA, children were confused by words like “area” and “adult” in the Priestley-era slogan, so the simpler “Stop, Don’t Touch, Run Away, Tell a Grown-Up” was invented), and a slightly revised curriculum devised by Dr. Lisa Monroe from the University of Oklahoma School of Education. In a video testimonial on the Eddie Eagle website, Monroe discusses the relatable nature of the new characters, which allows for children to internalize the video’s message. In another video, Monroe reiterates that Eddie Eagle’s bottom line is safety, and that if people get “too caught up in who’s sponsoring it, then they’re missing the bigger picture,” accusing people who question Eddie of putting politics over the safety of children. Research has shown that even children who learn about gun safety cannot be trusted to refrain from touching or using a gun if they come across one. The NRA has boasted about the program’s effectiveness both in its reach (last year the organization celebrated reaching 30 million students) and its role in cutting down child gun injuries. On Eddie Eagle’s FAQ page (under the question, “Have there been any evaluations of the Program’s impact in published/unpublished literature? If not, how do you measure its impact?”), the NRA claims that a single 2001 study published in the Journal of Emergency Nursing Online named Eddie Eagle the best gun accident prevention program out of 80. In reality, the article only looked at three specific programs (while mentioning that more than 80 gun safety programs exist), and said that the actual effectiveness of the program in action could not be evaluated on any data other than some anecdotal evidence. The study also pointed out that Eddie Eagle’s weakness was that it did not include information about trigger locks or other safety devices, which in the nearly 20 years since the study was published, have not been included in the curriculum. But what they don’t say is that during that same time, there have been improvements in emergency care, changes in gun laws, and a decrease in the number of homes with guns. And of course, they don’t mention the 362 firearm-related deaths in 2010 (Center for Disease Control and Prevention) for children ages 1-14 (of which 62 were unintentional and 81 were suicides). In fact, plenty of research has shown that even children who learn about gun safety cannot be trusted to refrain from touching or using a gun if they come across one. This was the subject of a 20/20 segment back in 1999, in which the producers hid three unloaded and disabled handguns in a daycare room after giving some of the children a lecture and even playing the Eddie Eagle cartoon for them. Children found the guns and played with them, regardless of whether or not they watched the cartoon. ABC News ran the same test in 2014 with different children, even playing the same Eddie Eagle video. Again, children played with the guns when they found them. More officially, a 2004 study by the American Academy of Pediatrics found that, while children were very good at memorizing and repeating the messaging of Eddie Eagle, they did not actually follow through in real life situations. “[Children] know what to say, not what to do,” Sanfilippo, who has also conducted research about the effectiveness of educational initiatives in reducing youth gun violence, told me over the phone. It’s one thing to have children recite something they learned in a fun cartoon. It’s another when they actually come across a gun. “We know they can recite the words, but you’re fighting an uphill battle,” she said. Between the impulsiveness of children and the fact that, as Sanfilippo put it,“[they have] no real sense of understanding of death or of the relationship between a gun and death,” children don’t truly internalize gun safety messaging. Eddie Eagle turns gun control into something more like impulse control. The program neither offers nor asks for any value judgment concerning firearms. 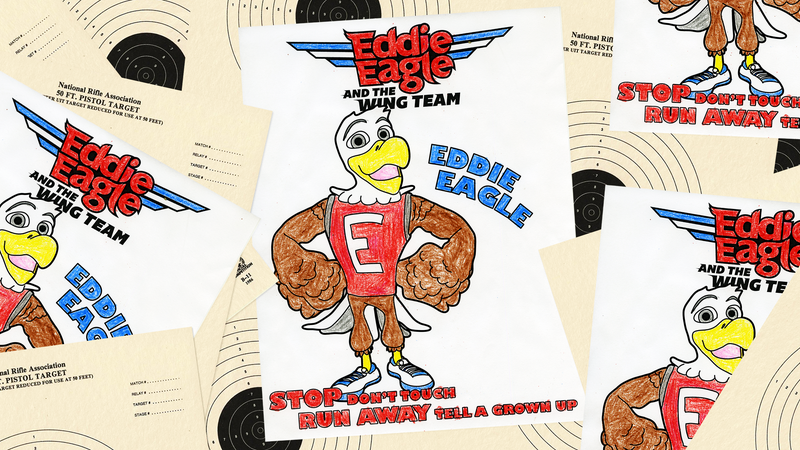 Like safety lessons about swimming pools, electrical outlets and matchbooks, Eddie Eagle’s sole purpose is to give children crucial information about what to do if they ever come across a gun. With firearms found in about half of all American households, it’s a message that makes sense. Eddie is never pictured holding or even touching a gun. Eddie doesn’t need to be pictured holding a gun. The world constructed around him is an NRA fantasy, where not only is owning guns an uncontested and normalized behavior, but children have a grip on subduing their urge to play with guns. It’s a world where adults aren’t responsible for leaving guns around, but children are responsible for making sure they don’t get hurt. Eddie Eagle turns gun control into something more like impulse control. It’s a demonstrably ineffective and reckless approach to child safety, which since it comes from the NRA, is perhaps no surprise. The NRA did not respond to my requests for comment. I will update this article if they do.